Move the mouse pointer over the question to which you want to add a branch. This displays the edit bar. Click on “Create branch” (1st icon on the left). 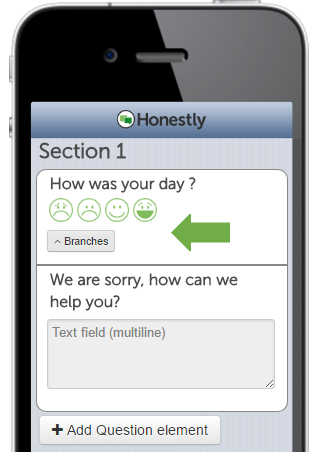 This allows you to add branched questions to your questions. Select the question(s) that should be assigned a follow-up event under “If”. Next, specify the event that should follow the question – e.g., “show” and mark the elements that should be displayed. Tip: Press and hold the CTRL key to select multiple elements. NOTE: Questions that are marked as "Mandatory questions" are ALWAYS displayed. However, if you want these to only be displayed for specific answers and still be mandatory questions, use the “show” element and the “make mandatory field” option when creating the branch. 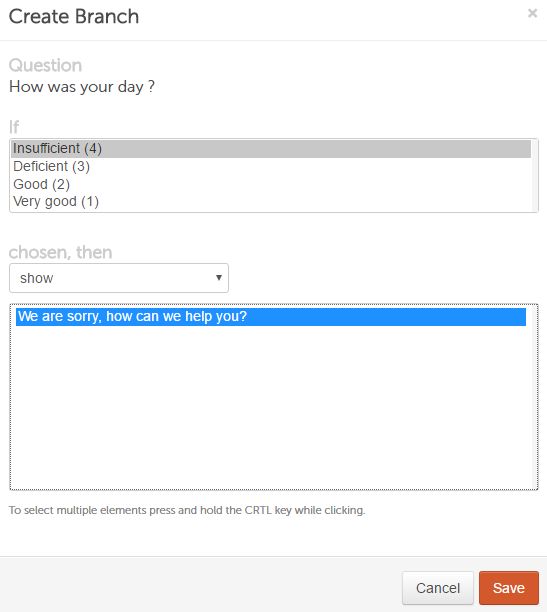 In addition, you can also use the “hide answer” and “end feedback form” options. Once you click on “Save”, the “Branch” icon is displayed in the question element that you have just edited. The branches are collapsed by default for better clarity.